On Saturday morning, November 12, a group of 70 law students convened in one of the rooms of the UAB Law School to participate in Constitution Day, an international event organized by the Program on Liberation Technology at Stanford’s Center on Democracy, Development, and the Rule of Law. The other two events were held at Stanford University and the University of Edinburgh. The aim of Constitution Day was to tag national constitutions with a predefined set of categories in order to feed the Constitution Explorer, a structured online database that will enable people to compare and contrast other countries’ constitutions. Students were given a crash course to get familiarized with the task—the annotation of the constitutional articles with a set of tags—and the taxonomy of concepts for annotation. As a result, each article of a constitution was categorized by subject, so that the Constitution Explorer user will be able to browse constitutional texts by concept and, whenever possible, will also find notes that will clarify each article and the issues that it relates to. This comment illustrates one of the issues that a legal taxonomy applied to different world’s constitutions may have to face in the future: conceptualization of local legal cultures. “Estado de las autonomías” is a creative invention of the 1978 Spanish Constitution, one that allowed a certain degree of decentralization while blocking a federal organization of the state. Let’s leave to the constitutional experts the discussion on the conceptual relations between “estado federal” and “estado de las autonomías”, but similar issues will most likely arise when tagging the Moroccan, Algerian, Tunisian, Belgian or Icelandic constitutions. Which new terms and concepts will then knock the taxonomy’s door to apply for inclusion? How the current taxonomy will accommodate them? I’m sure that an interesting deliberative process will emerge as soon as taggers in other countries start rolling-up their sleeves. Happy tagging! 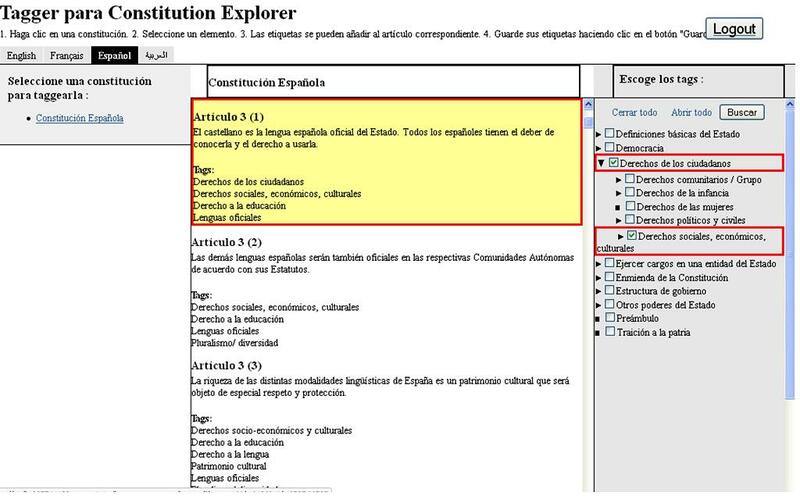 This entry was posted in crowdsourcing, political crowdsourcing and tagged Constitution, Constitution Explorer, Spain. Bookmark the permalink.